Everything is starting to run together. Lots of medieval towns, castles, cathedrals. Each is interesting in its own way, but I can’t really show that here in any way that anyone would care about. Even passing through locks is getting to be old hat. We must have done at least 5 just this afternoon. I still like to watch, if it’s convenient, but I don’t go out of my way any more. We visited Salzburg, and saw the house where Wolfgang Amadeus Mozart was born. We visited Nuremburg and saw where Hitler held big rallies, and also where the Nazi trials were held after the war. Probably our favorite little village so far was today’s Wertheim. 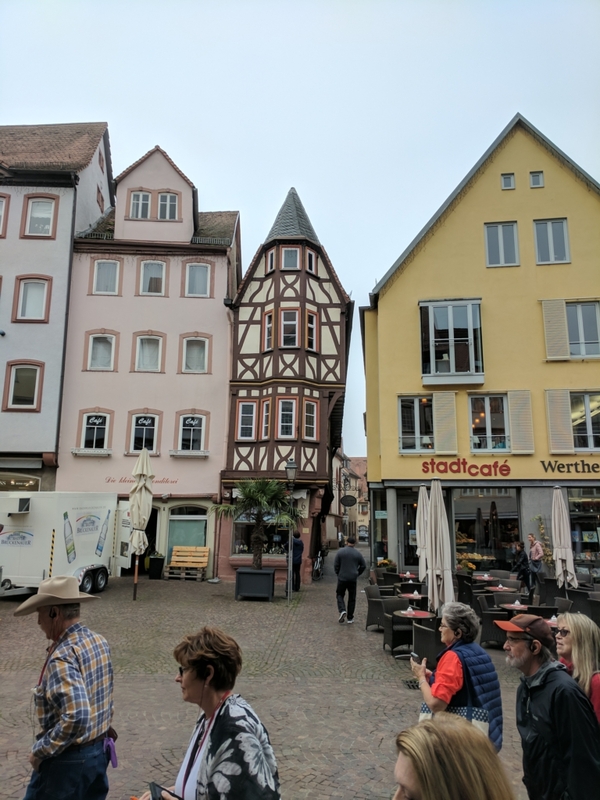 It is a very quaint little town that was completely untouched during World War 2 (unlike almost every other German town of any size) and still looked much like it did in the 1800s. There was a US army base just outside of town for 40 years, until 1992, and apparently the soldiers made a good impression and the feelings here are positive towards Americans. Our guide today told us that her sister used to clean the apartment of an American soldier and ended up cleaning his house permanently in California, and bearing his children too, of course. This house was built with a narrow footprint to reduce taxes which were based on amount of land. But upstairs they had more room. According to our guide, anyway. We reach Amsterdam on Friday, then stay 3 nights in a hotel. Sounds like a very interesting city. That narrow tall house looks sort of like a little gingerbread house. So do you think 15 days is a more than enough and maybe an 8 or 9 day river cruise would suffice for the more economical minded? You’ll enjoy Amsterdam. Plenty to see there. Does the Danube and Main canal freeze over in winter or can they run ships year round? I don’t think you answered my question. But I really wanted to see if you get this notification.